Meet our Fit Factor 2015 finalists. Today we reveal the six men and women set to have their lives transformed over the next 12 weeks. With the help of our exercise experts, the six will be put through their paces in what promises to be a gruelling few months that will see them pushed to their limits. Leading this year’s fight for fitness will again be our resident Fit Factor trainer, David Fairlamb. All six finalists met for the first time this week at David’s fitness studio in North Shields. They were provided with a nutrition plan which they must now follow. David said: “It’s been great to meet everyone and have them all together to get this year’s Fit Factor off to the best start possible. “With all the finalists now in place, I gave a motivational speech detailing the type of commitment and focus I expect for the whole of the next 12 weeks. “All the food has to be natural and what the body was designed to eat, alongside no alcohol. If I feel the level of commitment isn’t 100% any of the six can be replaced during this process. We have three reserves in place. “I’m expecting their lives to be transformed both physically and mentally in the next 12 weeks. Their Body Fat will significantly drop and they will look and feel fantastic, with a new found confidence and self esteem. In the first year of the competition, finalists lost a staggering total of 32 stones between them during 12 weeks. Four of the eight of the then finalists were waiting for gastric band operations, but after 12 weeks all four had lost at least four stones each and were removed from the hospital waiting lists. 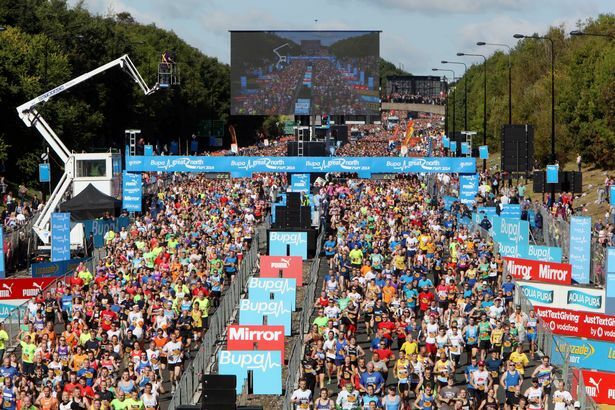 The participant who makes the most progress this year will get free VIP entries to the Great North 10k, the Great North Swim, the Great North Bike Ride and the Great North Run. But the hard work begins now for the contestants. They will be meeting three times a week and will be fully supported by David and his team, who have a wealth of experience in training people of all shapes, sizes and ages. Every Saturday morning they will take part in a boot camp at Tynemouth Beach before going home and sticking to their specifically designed food plan. Ian Gibson, who lost a staggering five and a half stones in 12 weeks during 2012, remains the Fit Factor’s most successful contestant. 10 health benefits out Fit Factor contestants can expect once they get moving. Keep excess pounds at bay: Combined with a healthy diet, aerobic exercise helps you lose weight and keep it off. Increase your stamina: Aerobic exercise may make you tired in the short term. But over the long term, you’ll enjoy increased stamina and reduced fatigue. Ward off viral illnesses: Aerobic exercise may activate your immune system. This may leave you less susceptible to minor viral illnesses, such as colds and flu. Reduce your health risks: Exercise reduces the risk of many conditions, including obesity, heart disease, high blood pressure, type 2 diabetes, metabolic syndrome, stroke and certain types of cancer. Weight-bearing aerobic exercises, such as walking, reduce the risk of osteoporosis. Manage chronic conditions: Exercise may help lower blood pressure and control blood sugar. If you have coronary artery disease, aerobic exercise may help you manage your condition. Strengthen your heart: A stronger heart doesn’t need to beat as fast. A stronger heart also pumps blood more efficiently, which improves blood flow to all parts of your body. Keep your arteries clear: Exercise boosts your high-density lipoprotein (HDL), the “good,” cholesterol, and lowers your low-density lipoprotein (LDL), the “bad,” cholesterol. This may result in less buildup of plaques in your arteries. Boost your mood: Exercise may ease the gloominess of depression, reduce the tension associated with anxiety and promote relaxation. Stay active and independent as you age: Exercise keeps your muscles strong, which can help you maintain mobility as you get older.Aerobic exercise also keeps your mind sharp. 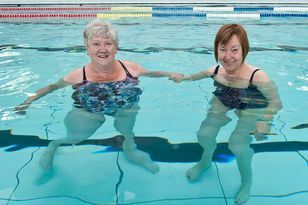 At least 30 minutes of aerobic exercise three days a week appears to reduce cognitive decline in older adults. Live longer: Studies show that people who participate in regular aerobic exercise live longer than those who don’t exercise regularly. Stephanie has two children and has no time for herself, so she comfort eats. She was good at sports previously but is keen to get in shape to be the best mum possible. She is a part time lecturer and doing a PHD. Stephanie said: “Moreover, I want to feel more confident and improve my self-esteem through a holistic life-changing regime that enables me to lose weight and gain amazing health and vitality. “Ultimately, as arguably the sole carer of my disabled daughter, who has Aperts Syndrome, and son with additional needs, I am committed to providing a good example, more simply put, being here for longer, for their uncertain future. Alan over-ate as a child and is hoping the contestant will give him a new lease of life. Alan said: “When I saw what past participants had achieved through the Fit Factor I just knew I wanted to take part. “I work in media production and am also a university student and my work requires me to move about quite a bit. “I could just feel myself getting knackered and sweating a lot of the time. Nigel is a new father and has health problems including bad sleep apnoea. He said: “I’m an older dad with a seven-month-old son called Nikolas. “So I wanted to take part because I want to be around to see him growing up. “I also suffer from sleep apnoea and I know that being overweight is not helping as far as that’s concerned. Jonathan is a former rugby player who has gained a lot of weight through contentment. He lost 10 stone on his own but has regained it - and more. Jonathan said: “I wanted to take part this year because I knew it was time I made a change in my life. “I actually lost a lot of weight a few years ago but then I got a bit complacent and ended up putting it back on. Claire has just got married after working in the Middle East for five years where she gained a lot of weight. She said:”I was living in Egypt right at the time of the uprising in 2011. “It meant I was under curfew in my flat between 3pm and 8am each day. There was no internet or mobile service and I had nobody to speak to, so I would comfort eat. “I gained about 5st and became very depressed. Katie has come to international attention in recent months after setting up a fundraising page that raised more than £300,000 for Gateshead mugging victim Alan Barnes. She gained weight after giving birth to her daughter, Gracie. She said: “My problem has been eating the wrong things at the wrong times. “I am very busy a lot of the time and sometimes work 70 hour weeks which means I don’t have time to sit down and eat structured meals.